Zimbabweans cower indoors, fearful of army beatings - SABC News - Breaking news, special reports, world, business, sport coverage of all South African current events. Africa's news leader. A prison guard in Kadoma who declined to be identified told AFP that those arrested over the protests receive little food and no bedding and that some need urgent medical attention for injuries. In the central Zimbabwean town of Kadoma, it is now a daily routine – armed soldiers and police patrolling through the quiet back streets as residents hide indoors. On the eighth day of a nationwide security crackdown, Tafadzwa, 23, made the mistake of stepping outside his family’s small crowded home to take a call on his mobile phone. Standing on the unpaved street at dusk, he was grabbed by four soldiers and three policemen who dragged him across the road and beat him with the butts of their rifles. “They didn’t say anything, they were just silent,” Tafadzwa told AFP nervously, still shaken by the assault on Monday. “The beating only stopped when my mother and brother came out to save me. 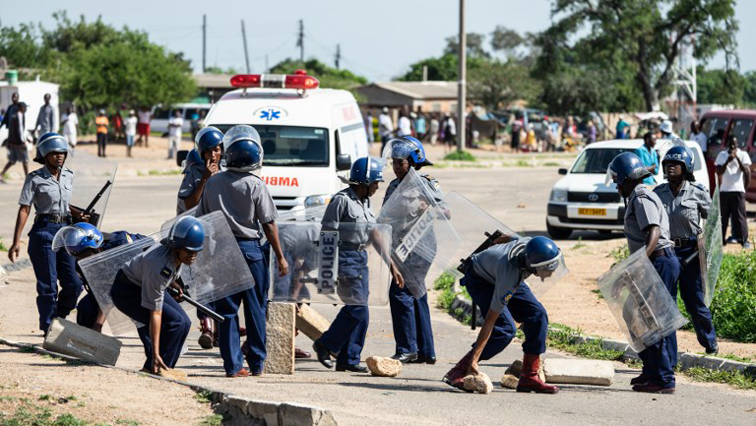 The military patrols appear every afternoon in the Rimuka neighbourhood of Kadoma, the scene of some of the most violent clashes between protesters and security forces when demonstrations broke out across Zimbabwe on January 14. One 20-year-old man was shot dead on the street in Rimuka by soldiers firing live ammunition, according to locals and the Zimbabwe Human Rights NGO Forum. Another man died on the way to hospital to the capital Harare. In Kadoma, shops now close early and an unofficial curfew is enforced from mid-afternoon. Like many of those beaten, Tafadzwa did not go to hospital for treatment as he feared being arrested as a suspected protester. “I haven’t left home since then. I’m too scared. I stay in,” he said, opening an exercise book to show the complex maths equations he does as a hobby. Now unemployed after previously working in a graphic design firm, he said he had missed a job interview this week. “I need work so I can pay for my education. This country needs qualified people,” he said. President Emmerson Mnangagwa, who took over from the ousted autocrat Robert Mugabe in November 2017, has vowed to punish any soldiers guilty of “misconduct”. But in Kadoma, locals believe the security forces have full authority to target young men to quash any further protests that first erupted after the government more than doubled the price of fuel. The price hike unleashed anger over the country’s latest economic woes, which have worsened despite Mnangagwa’s promises of a fresh start and a revived economy after Mugabe’s downfall. “It was a ‘popcorn’ protest, just popping up all over,” said Ophias Mukucha, 46, a father of five who is an MDC opposition activist in Kadoma. “People were determined to protest, it was justified. It was mayhem here with soldiers using tear gas and bullets. “One woman was shot in the leg and you could see the bullet wound. Bread that cost 90 cents a year ago now costs $2, said Mukucha, who earns $250 a month working for a disability charity. Several shops in the town have cardboard taped across their windows that were smashed by looters during the protests. “I hid in the back and fortunately we weren’t injured before we escaped,” said Blessing Mushonga, owner of the Chakawa general store, as he started to re-stock soap, maize and plastic buckets. On Thursday, the military guarded a fuel tanker as it made a rare delivery to a petrol station in Kadoma. Even with the hugely increased price, a long queue of vehicles formed before the tanker finished unloading. Zimbabwe has been desperately short of fuel, as well as banknotes, bread and medicine. “At court, their relatives turn up and then ZANU-PF (ruling party) supporters point them out to the police, who arrest them as well,” he said. This entry was posted on 25 Jan 2019,11:54AM at 11:54 AM and is filed under Africa, Homepage Latest Stories Slider. You can follow any responses to this entry through the RSS 2.0 feed. Both comments and pings are currently closed.